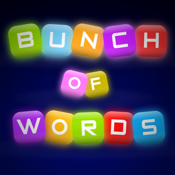 Your brain will love Bunch of Words, the new word puzzle game! Swipe with your fingers and make words, get bonus with crosswords, 1-color words and long words. You can practice other languages! You can play the game in english, german, french, spanish, portuguese and italian. * Challenge: Beat the objectives for each level. * Survival: Try to beat your record surviving as long as you can! * Time Attack: Get the best score in a limited time. * Zen: Just play for fun, there is no time left. Relax with the chill out music and practice your skills! Also, there are easy, medium and hard levels, it's fun for everyone!